We’ve had a lot of snow this spring. Enough that I watched the roofs of our buildings with caution. 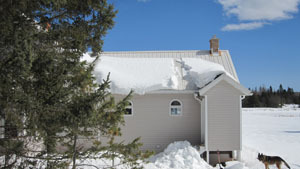 We have metal roofs with a fairly steep pitch, so the snow, when it is unimpeded, slides of automatically when the weather warms up. On the addition to our house, the snow on the west side is impeded by an entry-way we built. The roofs on the rest of the buildings all did their jobs of shedding their snow, except this one. 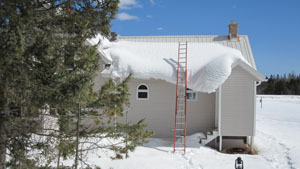 The snow was really piling up, and I was worried that an unbalanced load on that roof could cause some problems. The temperature has been warm enough lately that the sap has been running, so I’ve been busy. My subconscious thought has been that the warm weather will shovel the roof for me. Then I was reading my facebook last night, and learned that a friend of mine had her attached garage collapse, causing her to have to temporarily move out of her house! Yikes! So today I hauled the heavy ladder through the snow, grabbed my big snow shovel, and climbed the roof. This job is one of them that isn’t as bad as I make it out to be. I tend to put it off, when I should just get on with it. The ladder is heavy, and it is stored in a place in the garage that is hard to get it into and out of. I have to admit that when I was done shoveling a channel for the snow, that the aesthetics of the roof have suffered, but I do feel better about the balance of the structure now. Hopefully the channel will allow for a speedy shedding of the last of this winter’s snow. This entry was posted on Thursday, March 28th, 2013 at 8:31 pm and is filed under Uncategorized. You can follow any responses to this entry through the RSS 2.0 feed. You can leave a response, or trackback from your own site.